Streamlined your sales funnel using Sugester CRM. Start your CRM trial for free! Looking for sales software? Try Sugester CRM! Our solution will enable you to restore order to your merchants, ease your customer relations, and allow you on what is most important in business - profits! Sugester enables you to store an unlimited amount of data about your customers. You can easily import data from Excel or other CRM systems. 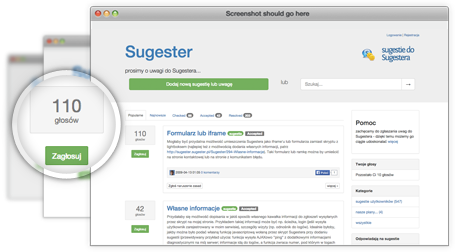 Sugester enables you to send out emails (group emails and on the basis of templates) as well as automatic phone conversation registration. Thanks to this you will always have the complete client interaction history available. Inviting your coworkers to Sugester is easy. In a convenient way you will be able to manage their permissions and monitor their performance. 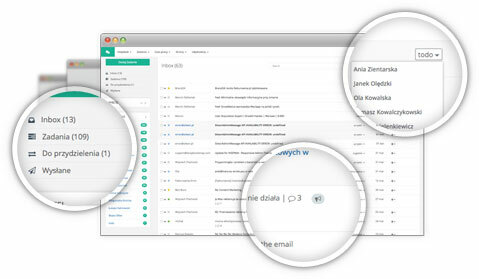 Sugester CRM allows you to conveniently store large quantities of customer information. The client card possesses all sorts of data, this includes contact information, interaction history and notes. You can also add your own fields. Sugester also has the built-in option for importing data from Excel and other programs (in the XLS and CSV format). 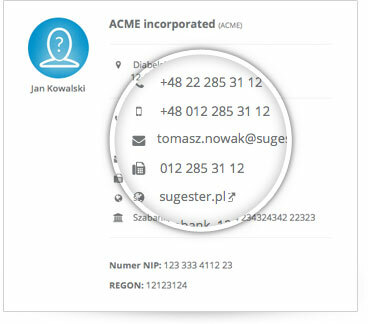 Sugester CRM has a built-in customer email, so that you do not have to leave our App to connect with your clients. Your work is simplified through features such as; email templates, automatic responders, masss mailing or contact reminders. Add an unrestricted amount of users to your Sugester CRM account. Control user priviliges, so that no data will fall into the inappropriate hands. With Sugester you can delegate work to your coworkers, measure their performance and generate periodic performance reports. When interacting with customers, it often happens that you will have to answer the same question multiple times. Instead of wasting time by providing the same answer, it is better to define a template, and use it for whenever the same question is asked. This will allow you to save time and help your customers more swiftly. Customers dislike the unkown and they hate waiting for a reply to their question. Though we do not recommend full automation for communication with clients, it is worth informing them automatically about having received their correspondence. Thanks to this your clients will be more satisfied and eager to continue doing business with your company. Follow-up is a key element in client communication, especially as your prospects will not purchase your product if they forget about you. Which is why when using Sugester you can use the 'Send and Remind' option. Unanswered emails, will return to the top of your inbox after a short period of time. Funnel graphs are a great way for visualising your sales process. Sugester will automatically generate these funnels on the basis of status, that you attach to your clients. You do not have to use the predefined status, our CRM allows you to create as many of your own as you need. InvoiceOcean.com is one of the best and most popular invoicing and warehouse management programs in Poland. Thanksto this you will be able to easily generate invoices, email them to your customers, and get paid online and much more. Integrating with Sugester means an automatic synchronization of customer databases between your accounts. Without CRM software it is hard to track who, and for what purpose our coworkers conducted a phone call. Sugester will automatically log the most important information from the call (date and time, duration, phone number), and automatically register it with the client. It will enable you to add a note regarding the phone call. Thanks to this, contact history is available and many employees will be able to professionally deal with a client, with whom they have previously interacted.